to our kennels, beloved siberian huskies and one spoiled malamute. We are dedicated to the original - working and beautiful siberian. Our philosophy is keeping high working ability in the breed together with good temperament, the charming appereance, the type and structure as defined in it´s breed standard, and the overall sound heath. Our beginnings and our view point at the siberian husky breed in the world before and today. 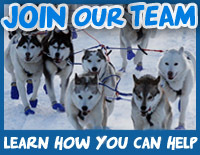 Learn about our racing and breeding goals, and the overall philosophy of Kipp d´Amunsen Siberian Husky Kennels. Each one of our dogs is a family member, a lifetime friend, a trusted partner on the trail and highly respected being. To meet our current athletes, please visit their special Team Athletes page. aka the handlers, coaches, feeders, healers, rubbers, breeders, mom and dad, the slaves, cleaners, genators and poop scoopers. Yes, that is us, all in two persons: Jachym Lukes and Katerina Paleckova. We come from Czech Republic, but moved to Northern Sweden in 2005, to live our dream. 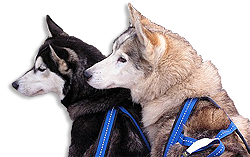 Besides racing and breeding dogs, we run an outdoor adventure company, B & B, and internet shop for sled dogs, horses and other working animals, called NORDIC HUSKY FARM. Is the driving force behind the kennel. 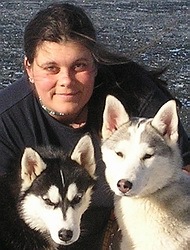 She started the kennel back in 1993, three years after she got her very first siberian husky Ford. Fascinated by and drawn to wilderness, wild animals, wolves, horses and sled dogs, Katerina´s dream has always been to live the simple, rugged outdoor life and bush existance in the "middle of nowhere", together with her beloved huskies. From sprint racing which she found stressful and unsuitable both for the breed and her lifestyle, she started converting to longer races, where she could prove the toughness of her team and herself, as well as meet the "elements". Katerina believes that it is the hardships, challenge and acomplishments of long, hard and tough trips in the wilderness, that create a bond between the dogs and their musher, that has to be experienced to be able to understand. Besides her dogs, whom she refferes to "the kids" or the "team", her other interests count drawing and art work, nature photography, writing, hiking, nordic walking, holistic and natural health, and cooking. 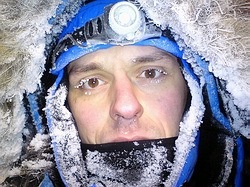 Is the dedicated dog handler and second musher. He is the "behind every successful woman is a dedicated man" kind of guy. His passion for photographing, film making, programming and webdesign work make him the "team´s" main technical support and image creator. Although Jachym would rather spend time fishing, swimming in the lakes or wondering around the wilderness neighbourhood, he helps with training the main string team, and is usually responsible for the puppy and senior teams. Unlike Katerina, he hates attending dog shows and he rather spends time playing with all the dogs or watching a good film. Jachym likes photography, fishing, cooking, computers, easy walks and when he has the mood for it, he is quite good at handcrafting and can surprise with a sudden invention or innovation. Hmm, why cats on a dog web?! Our beloved and totally spoiled cats (special country breed!) were always an unseparatable part of our family. Many of our dogs don´t mind to share cauch with them when given the oportunity to spend time indoors. „Grandma“ Ajdi – the foundation female of our kennels and her daughter Alyeska were regular house dogs who enjoyed company of cats enormouslys. The fact is, that they together ocupied all chairs and cauches in my parents´ house, so we usually watched TV from the kitchen. We often here stories about huskies hating (and killing) cats, that they could never get used together, etc., but we have different experience. Puppies born in our kennel are getting used to cats since the beginning. 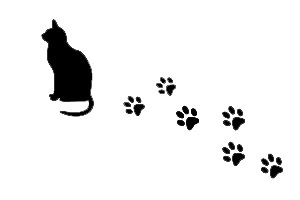 We find cats being helpful not only with socialisation and education of huskies: Alyeska loved Berushka, a little black and white cat who always found her „bad“ hind leg and laid against it (cats consumpt negative energy, while dogs give the positive one). And – who else would stick nose into fussy eater´s dish and make them eat, when not the kitties? While the cats of my parents still reside with them, we could not resist long in our new home in Sweden, and brought two sisters - Ronja and Pippi. They are - well, typical cats. Cute and pretty, and enoying and mischevious, as only cats can be.